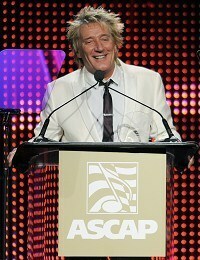 Rod Stewart is keen to play with the Faces again. "It's finding the time," the veteran rocker admitted in Hollywood where he was being honoured by Ascap (the American Society of Composers, Authors and Publishers). "[Ronnie Wood] has to do the Stones tour and I can't wait for him to make up his mind whether they are going to tour," Rod explained. "If that lot would just pack it in and say 'we've retired' then me and Ronnie could get on with it!" he joked. Rod confessed he didn't get a chance to see former Simply Red singer Mick Hucknall's attempts at being the Faces front man last year. "I heard they were really good and I sent an email to Woody (Ronnie Wood) congratulating him." "They only did one show, whether they're going to do any more I don't know," he admitted. Regardless of a Faces reunion, the singer has been enjoying returning to his musical roots with some new songs. "I'm doing a blues album now [with] Jeff Beck and it'll be another milestone for me," he confessed. "That's how I started out with folk music and blues stuff."